I'm loving these beta patches! Awesome looking zones, new stuff to discover, and of course tons of new pets. Updating the long list of possible pets coming in WoD is something I look forward to each week. 10 new pets added to the Pet Journal in the latest beta patch. Wheeee! For a full list of datamined items and spells, see Wowhead's post on this latest beta patch. The (SAVAGE) toucans in all the lovely datamined colors finally showed up in the journal. Their source is currently Pet Battle: Draenor, not cageable - meaning it's likely that they'll be wild pets. The next two pets will be from world events. Lovebird Hatchling (BoU) is listed as a vendor pet during Love is In the Air, and will cost 40 Love Tokens. The Bush Chicken (BoU) has a more unique source, at least according to developer, Jeremy Feasel: "you rescue it from a delicious doom during Pilgrim's Bounty :)"
There are two new pets that will come from unknown drops, but at least one (Stonegrinder - BoP, may also be known as Rockchipper) will be from Draenor. The Pet Journal didn't specify where the Goren Youngling will come from. LeCraft shared that this pet has different colors and looks though! I can't wait to find out where to collect all of the Goren. It looks really awesome! Speaking of looking awesome, a new Grand Master Trainer will be showing up at the Darkmoon Faire next expansion. Christoph VonFeasel (Christoph Willikens Dennis Ragnaros VonFeasel the First, to be exact, according to his daily quest) will reward Greater Darkmoon Pet Supplies, and inside you'll have a chance to loot Syd the Squid (BoU). I just hope that *she* won't turn against me and decide to go all shadow priest Mindbender on me. Last but not least for the new pets is the Gnawtooth Rat. This pet isn't exactly new, as it was datamined during alpha, but it's finally made its rodent-y way into the Pet Journal. The source is currently Pet Battle: Garrison, and it's not cageable. This might mean the Gnawtooth Rat is wild but can only be found inside or around your garrison. Let's just hope it doesn't gnaw through anything important - I'd like my buildings to remain standing, thanks! 2. Battle-Training Stones (increases a pet's level by 1 on use) were added; each pet family has their own specific stone. Note that the epic quality stones probably WON'T be officially released, and are for testing only. The common quality ones that level your pet up by one level are much more reasonable, but it's a wonder where they'll come from. The new garrison dailies, perhaps? 3. The Pet Menagerie plot for your garrison was datamined, but apparently it requires level 98 to unlock. LeCraft goes on to say that the garrison pet battle dailies might show up regardless, however keep in mind that if they do right now it's a bug. As a sidenote for the garrison pet battle dailies, there's an interesting quest item that seems to be related: Mark of Pet Mastery. We'll probably need to turn in one or a number of marks to complete pet-related quests in our garrisons. I just wonder how many NPCs we'll have to defeat each day? 4. There's going to be a new non-combat companion, the Mystical Spring Bouquet (BoP). It's not yet in the Pet Journal, but Wowhead has additional details on it: "This flying pet is a companion. It cannot enter battles and does not have stats." Viewing the 3D model reveals that it's a floating potted plant of sorts. Where will it come from? New secondary profession: Flower Arranging? :P Kidding! Herbalism might make sense though... but I doubt it lol. 5. To quote LeCraft on Twitter, "*SOMEONE* loves the pug". 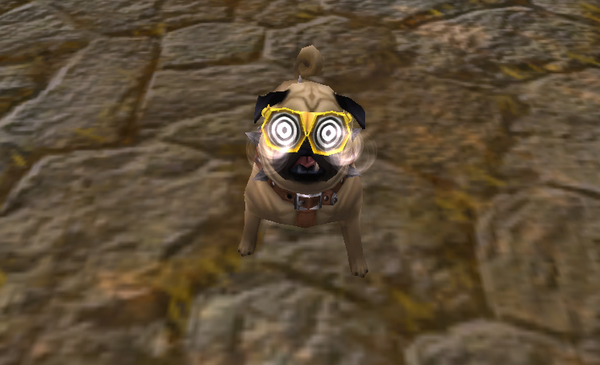 And that someone is Jeremy Feasel, who has added more Perky Pug vanity items. "Lil' Starlet" Costume, "Mad Alchemist" Costume, and Perky Blaster. I guess if my pug has to suffer through me playing dress up with it, at least it can have the satisfaction of possibly setting off a firework in my general direction? Hmm... yea. I think I'll keep the fireworks a secret from my Perky Pug.